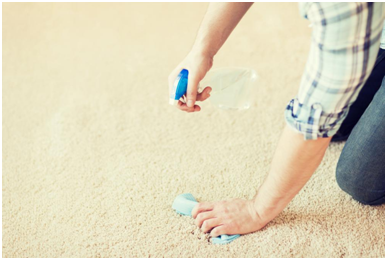 How do you remove unsightly stains from your carpet? Do you wipe them away with an all-purpose cleaner, meant to clean windows and glass table-tops? Or do you forget all about the stain, resulting in an ugly patch of brown on the carpet? It isn’t difficult to find a carpet cleaning service, one that will clean the toughest looking stain from your beautiful home or office carpet. Finding an effective carpet cleaning method, on the other hand, requires some knowledge of common carpet stains. According to leading carpet cleaning experts in Bakersfield, there are five different carpet-cleaning methods being used today. Each method is effective in its own right yet offers certain disadvantages that make them unsuitable for cleaning certain types of rugs and carpets. Additionally, all five work well, as long as the person cleaning the floor furnishing knows what they’re doing! Enlist help from a professional carpet cleaning company as it’s difficult to determine which cleaning method works to remove what stain. Drinking a glass of red wine after a long, hard day at work is the epitome of luxurious necessity. However, even a little spill on your carpet can leave an unsightly stain – ruining the look of your expensive floor furnishing. It’s difficult to remove a wine stain, once it has dried. People live such busy lives nowadays that it feels totally normal to rush everything and everywhere. Sometimes our clothes and furniture suffer consequences of this – in the form of food stains marring the fabric of a favorite couch or your office carpet! Coffee stains should be treated (spot-cleaned) the minute spill occurs. Once dry, it can become difficult to remove the ugly brownish stain. Accidents happen. Even your trained pet can mess up the carpet by urinating on it! You should be extra vigilant if you have a puppy or small child at home. Fresh urine is easy to remove but often homeowners don’t realize their pet has had an accident. In addition to the sickly yellow looking stain, urine odor can make your entire house smell like a fish market. Picture this: your 5-year-old is eating chocolate, most of which has melted and smeared on her fingers. Instead of wiping her chocolate-laden hands on the provided napkin, she runs them all over the white and furry carpet of the living room. Removing chocolate stains is difficult even when fresh. First you’ll have to scrape excess chocolate without smearing it further. There is no guarantee that the carpet will be completely clean after using a DIY solution. Are you looking for an expert carpet cleaning service in Bakersfield for your office carpet? Call Excellence Janitorial Services & Carpet Cleaning.